Smoking alters the genes of lung cells, US scientists have shown for the first time. The Boston University team found smokers had different genetic patterns within their lung cells to those of non-smokers and former smokers. They hope the patterns could be used to predict lung cancer risk as they also vary between smokers, and some carry a bigger threat than others. The researchers believe it could help to explain why although cigarette smoking is responsible for 90% of all lung cancers, only 10% to 15% of people who smoke end up with the disease. And it also suggests that smokers who give up the habit may remain at risk of lung cancer for decades because, although some of the genetic changes are eventually reversed, the process may take many years. Dr Avrum Spira and colleagues took lung cell samples from 75 volunteers - 23 who had never smoked, 34 who were current smokers and 18 who had given up smoking. 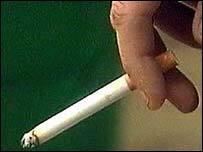 They looked at the gene patterns within the lung cells and found changes in smokers that were not seen in non-smokers. In the smokers, some genes that are thought to promote cancer were switched on and others thought to protect against cancer were switched off. Gene patterns also varied among the smokers. A subset of smokers expressed some genes differently from most other smokers. One of these developed lung cancer within six months of the analysis. The researchers believe it may be possible to predict a smoker's risk of lung cancer by looking at their lung cell gene patterns. "Gene expression profiles of smokers with cancer may differ from those of smokers without lung cancer," they said. Dr Spira's team says the gene changes also appear to be related to the duration of time for which a person had been smoking. The gene patterns among former smokers began to resemble those of never smokers after two years of quitting smoking. But several genes failed to change back. This may explain why past smokers continue to have an increased risk of developing lung cancer years after they have stopped smoking, say the study authors. Dr Spira said: "It's still safer to quit smoking. Quite apart from reducing the risks of other diseases caused by smoking, the risks of lung cancer also go down dramatically. "Previously some had hoped that after 10 or 20 years after quitting the risk of lung cancer may have gone down to that of a non-smoker after the lungs had cleared themselves out. "What our work is suggesting is that the risks may never go down to that of someone who never smoked." Cancer Research UK scientist Dr Marcus Munafo said: "There may be a point in the future that we can do something more for people at higher risk, in the same way that people with a family history of breast cancer are offered higher levels of screening. "But we are a long way off that becoming a reality." Mr Ian Willmore, head of communications at Action on Smoking and Health, said: "It would be great if doctors are able to predict which people would get cancer. "But even if they can this is not going to take away from the huge health damage done by smoking and the need for people to stop smoking," he said. Dr Mark Britton, Chairman of the British Lung Foundation said: "Much further research and testing would need to be done to ascertain the reliability of this screening of gene expressions before it could be used in the UK."